After trying and loving the Sally Hansen Nail Growth Miracle Serum (which I have reviewed here) I thought I would try more products within the Sally Hansen Nail Growth range. I picked up the Vita Surge Growth Gel Treatment and the Nail Growth Miracle Growth Treatment and thought I would use them both together. The Vita Surge Growth Gel is a green gel containing blue Vitamin A microbeads. I apply a thin layer of this to each nail and massage in to my nail and cuticle bed. I find that this is really hydrating and love to carry this around in my bag so I can apply it 2-3 times a day. The Nail Growth Miracle Growth Treatment is a clear varnish which I have been using after applying the gel. This says that it can be applied over coloured nail varnish so is great for you girls who always paint their nails. This dries really quickly and leaves nails looking beautifully shiny, but I find that the varnish starts to peel within a few hours and doesn't last a full day out. My favourite of the two is definitely the Vita Surge gel. As I massage this in, this takes less time to apply than the polish which of course needs a few minutes to dry. As the polish peels I feel that the nail growth I have achieved has been due to the gel. However, after using these products for over a week and a half, I must say that I am slightly disappointed. 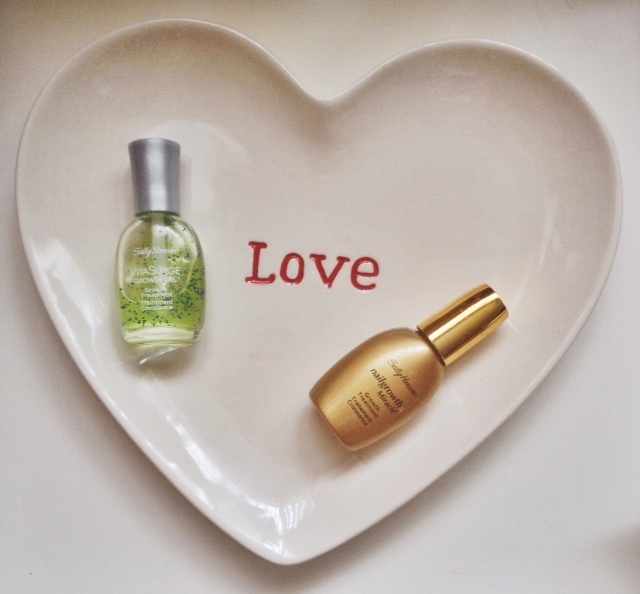 The Miracle Serum I used originally was definitely more effective and I found that my nails looked healthier too, which for someone with really short nails, I was really chuffed about. I won't be repurchasing these unfortunately and in future I will definitely be sticking to the Miracle Serum. Have you used any of the Sally Hansen growth treatments? Do you have any tips for someone who is trying to quit a life long addiction to nail biting? Yeah but I'm glad I tried them I love trying new things :) might have to try the hard as nails one next I think that's the only one i haven't tried! The Miracle Serum is definitely my favourite of the ones I've tried. I'm now so desperate for them to grow I've got a pile of cuticle oils and the Miracle Serum to massage into my nails throughout the day as I want them a nice length for my birthday. Fingers crossed it works! The Vita Surge gel sounds really nice! Great review! Wow, that's what I was searching for, what a stuff!Women are always concerned about their nails. I give my nails a makeover with Sakare's nail treatments and am very satisfied with the results.